Prompted by Kaelin Shipley’s piece, “Letting Go,” in this issue, and especially since my mother died, I have been thinking a lot about downsizing a house, hers and mine. 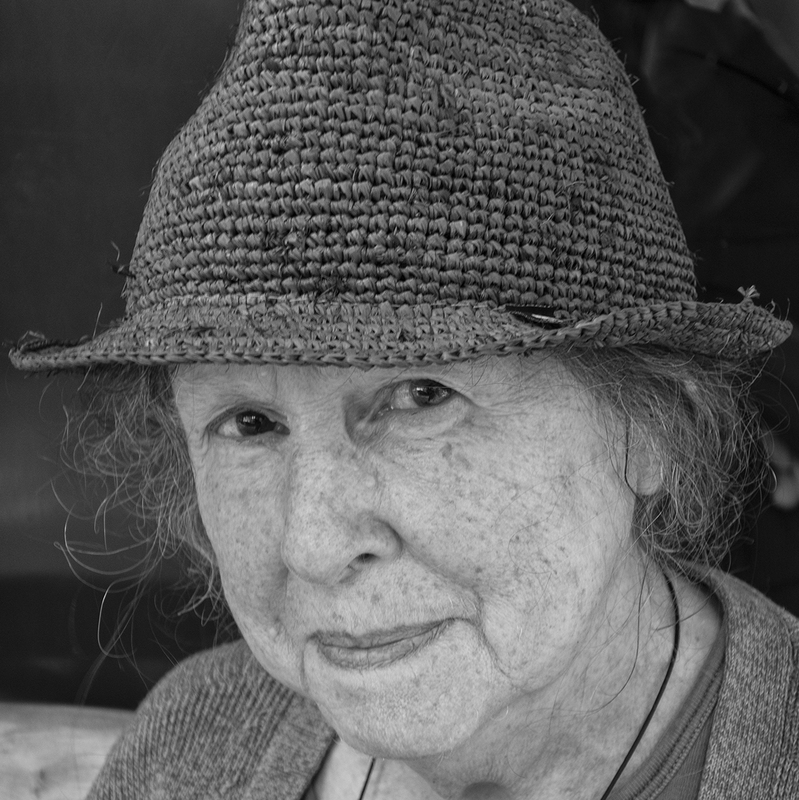 My mother lived in a three-bedroom mobile home in Santa Cruz, California that she filled with things she loved. Mom travelled a lot, mostly as an activist, and brought back souvenirs from every place she went. She also, with her last late husband, made lovely pieces of stained glass. Together they collected rocks and for decades made them into beautiful things. Every surface was crammed with things. What does one do with so many treasures, so many memories, so many associations? When my family and I traveled to Santa Cruz for Mom’s memorial service, we also prepared her home for sale. We sorted. We reminisced. We threw a lot into a dumpster and took even more to Goodwill. And we set aside what we were taking home for ourselves (with a surprising lack of competition or rancor, may I add). The space we put on the market lacked any of Ruthie’s personality. I sent boxes of her things back to New York. She had a collection of pre-Columbian pottery (not, I fear, authentic, but really convincing) I had long coveted that finally came to me in her will. She loved masks and had dozens and dozens of them in every size imaginable, made from every material imaginable. I wheedled them out of my niece. 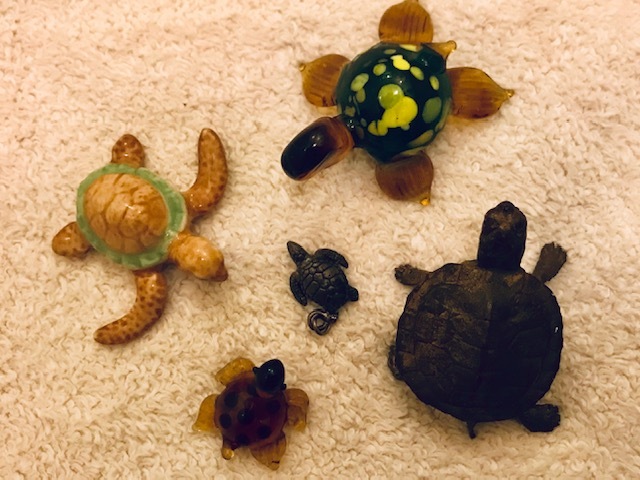 My sisters and I divvied up her turtles (I took the glass ones, the ones that range in size from one inch to smaller than my pinky nail). One of my sisters took all the rocks, but I was given the piéce de résistance: a large, powerful stained glass depicting an ancient bird. I love having these reminders of Mom in my house. I love noticing the turtles and the tiny terracotta cups, all displayed on my bookshelves. Or drinking coffee from one of her mugs. These things give me pleasure, but they also amplify my own beloved mess. As I look around at my stuff, I know that at some point I will have to leave my house and I try to imagine where and how everything will go. How to downsize another life? Will the task be mine once I can no longer manage the stairs? Or will it fall to my heirs? Meanwhile, I am enjoying every bit of the clutter. Addendum to my mother’s story: We sold her mobile home to a couple who must have known Ruth Hunter (or about her) in the community because they promised that for the next two years, they will contribute money to her favorite causes. View More: Next piece "Spring 2019", Home, Archive. Your essay made me cry at he loss of your mother and laugh at the story of your mother. Thank you for sharing photographs of the marvelous art pieces she made — I too would have gone for the glass — and for providing such a wonderful role model for how to easily live with and enjoy the small ornamentations of your mother’s life within your own. You make it sound so easy and natural, I am destined to follow your model with pleasure. Sorry for you loss.